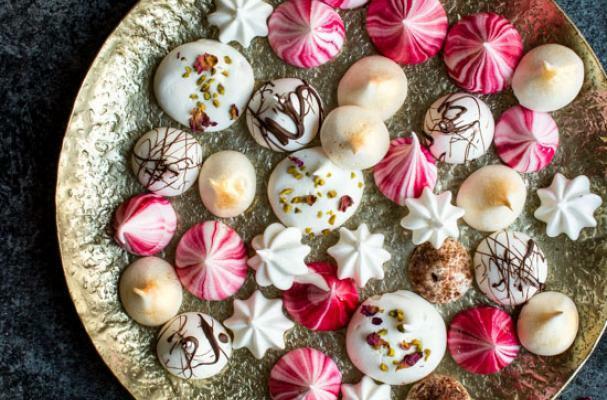 Foodista user Lauren Short of Lauren Caris Cooks shared a dynamite recipe for vegan meringue cookies. Meringue is traditionally made with a combination of egg white and sugar that is fiercely whipped until beautiful snowy white peaks are formed. Lauren replaces the egg white with chickpea water in this vegan version. This is a genius recipe because the feather light cookies are delicious and can be served to vegans and non-vegans alike. Step 1: Preheat the oven to 100°C. Strain the can of chickpeas and reserve the water. Store the chickpeas in an airtight container in the fridge and use for whatever you like. Place the chickpea water in a very clean, dry bowl. Step 2: Using an electric whisk or stand mixer (with the balloon whisk attachment) beat the chickpea water on a high speed for 5 minutes. Then, add the sugar in 3 additions, beating on high in between each addition until it is completely incorporated. Step 3: Once the sugar is incorporated, sprinkle the cream of tartar over the top, and beat on high until the meringue is smooth, glossy and forms stiff peaks. Step 4: Transfer the mixture into a piping bag and chop the end of the bag off with about a 2cm opening. There is no need for a piping nozzle for the round kisses. Line a flat baking tray with parchment paper. Then hold the piping back perpendicular to the baking tray and pipe a blob of meringue about 2 inches in diameter and then stop squeezing the bag and lift to create a point. Do this until all the meringue has been used up, leaving a gap between each meringue. Step 5: If using nuts on top, sprinkle these on before baking. Bake for 70-90 minutes, or until the meringues are hard on the outside the whole way down. Then remove from the oven and allow to cool completely before removing from the tray, they should peel off very easily once cooled. Step 6: Store in an airtight container for up to 10 days. RECIPE NOTES: To make the pink coloured meringues, before you add the mixture to the piping bag, use a kebab stick to add some gel food colouring around the bag, then close the bag so it's flat and press it down to spread the colour around the bag a bit. It doesn't need to be in straight lines. Then add the meringue and as you pipe, the mixture will pick up some pink colouring on the outside of each kiss. Bake as normal.